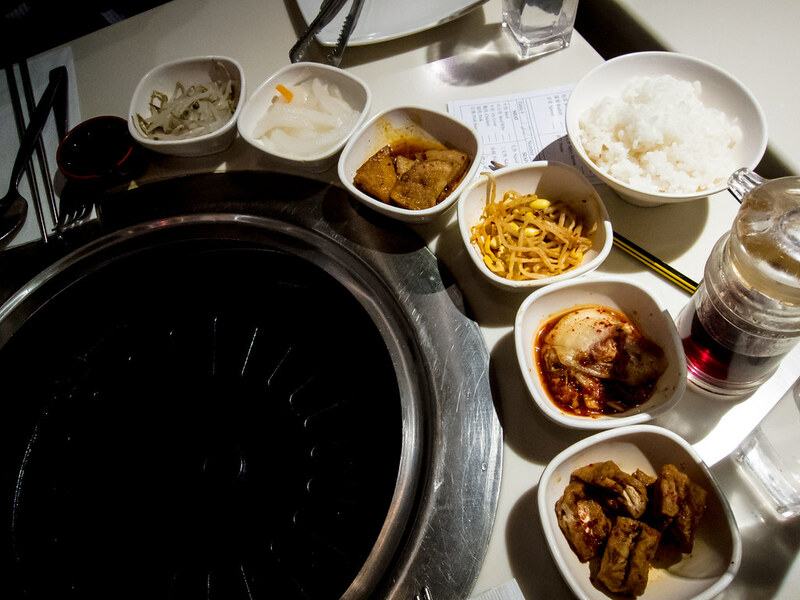 Sometimes, I get a craving for AYCE Korean BBQ. My appetite has shrunk over time, but the combination of a smoky grill and endless short ribs calls to me every few months. I usually regret the indulgence during the food coma after, when my waistline is uncomfortably snug. My body however has the memory of a goldfish and after some time, the craving hits again. 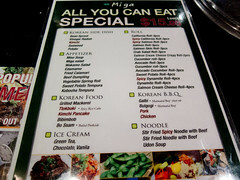 This was how The Hubby and I ended up at Korean Grill House on Queen St, one Friday evening for our date night. Chubby buddies for life. 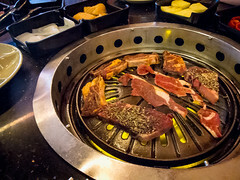 Atmosphere: Korean Grill House was my go to AYCE Korean BBQ in Toronto, the Queen St. location especially. The restaurant is usually full, and stays so late into the night thanks to their night owl deal (same pricing as lunch, $6 cheaper than dinner). 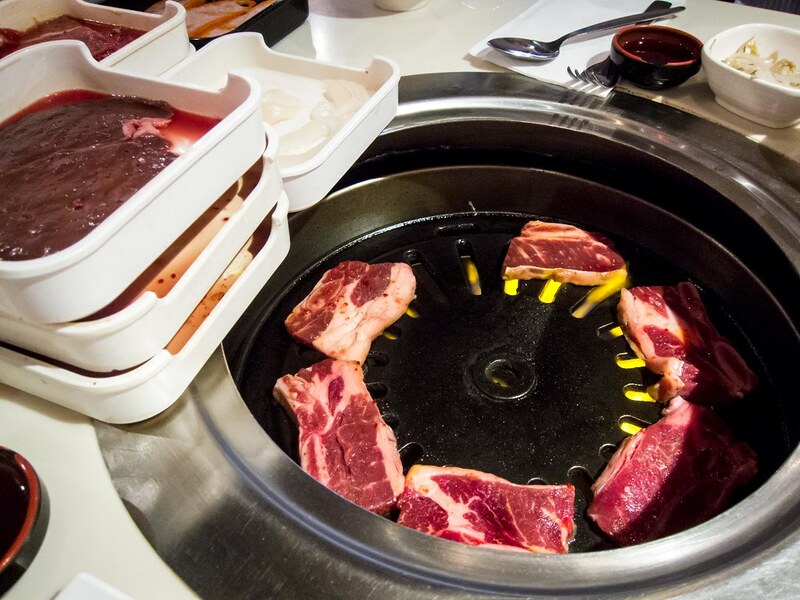 Tables are equipped with built-in grills, shared between 2-4 people. The space was well ventilated, but I do always leave smelling like bbq. With the years of smoke and oil, the floors were a little sticky but overall the restaurant was clean. Service: Unfortunately, this was an occasion where service impacted my experience negatively. When I visit an AYCE restaurant, I give great leniency for service because there are large complex orders. However I don’t appreciate restaurants who aren’t transparent with their menu. With our first order we were told about pork belly, an additional item that wasn’t on the menu but one the server manually wrote on our order sheets. For our second order, we tried to order pork belly and it never came. We thought maybe they just forgot and tried to order it again, still nothing. Rather than placing a fourth order, I asked a server about our previous requests. The server returned to tell us that the kitchen was all out of pork belly, at 6pm on a Friday, before their evening peak. The Hubby believed this, I was more skeptical. Once we saw the couple next to us receive two trays of pork belly and continued to see trays being served at other tables, we were confused. If the restaurant needed to limit orders on an item, I would much rather know ahead of time, than feel like I’m being deceived. This left a sour note to an otherwise acceptable meal service. 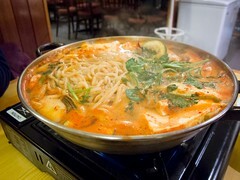 Food: At Korean Grill House, for dinner there were two AYCE options. The first included beef, pork, chicken, beef ribs, red sausage, ox liver, salmon, squid and fish fillet for $18.99 Fridays to Sundays and on holidays. To add lamb and shrimp was an additional $2. To add vegetables including lettuce, mushroom, onion, green pepper and pineapple was an additional $3. Everyone at a table in the same party had to order the same options. We chose the basic without shrimp, lamb or vegetables. Of the basic items included I usually skip the fish fillet, which is hard to grill without falling apart and not flavourful. In comparison, the salmon offers a lot more taste and holds together better. 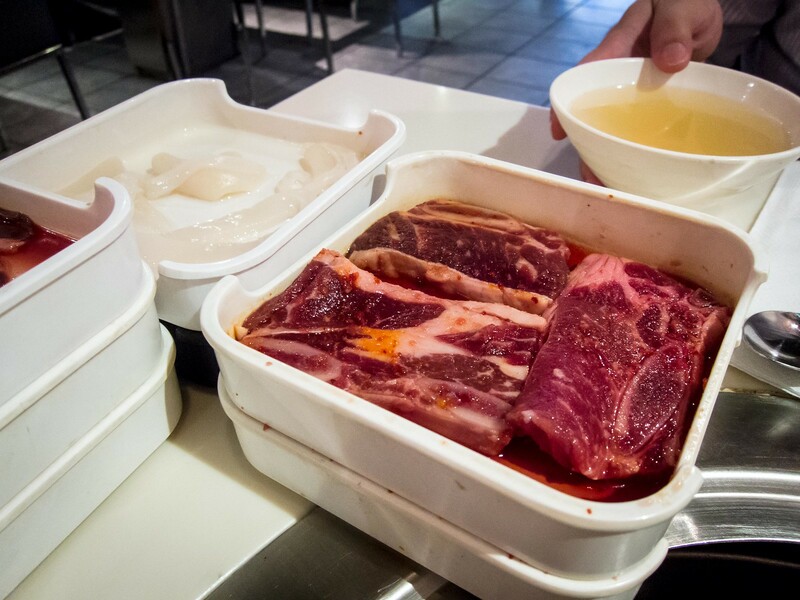 6 side dishes, beef broth and steamed rice are included and can be reordered. From the side dishes, I like to snack on the bean sprouts, kimchi and pickled radish while waiting for the meat to cook. That night, I enjoyed the quality of the beef ribs, salmon and squid. The ribs were lean and meaty. In the past, I have received poor cuts with all fat on later orders. 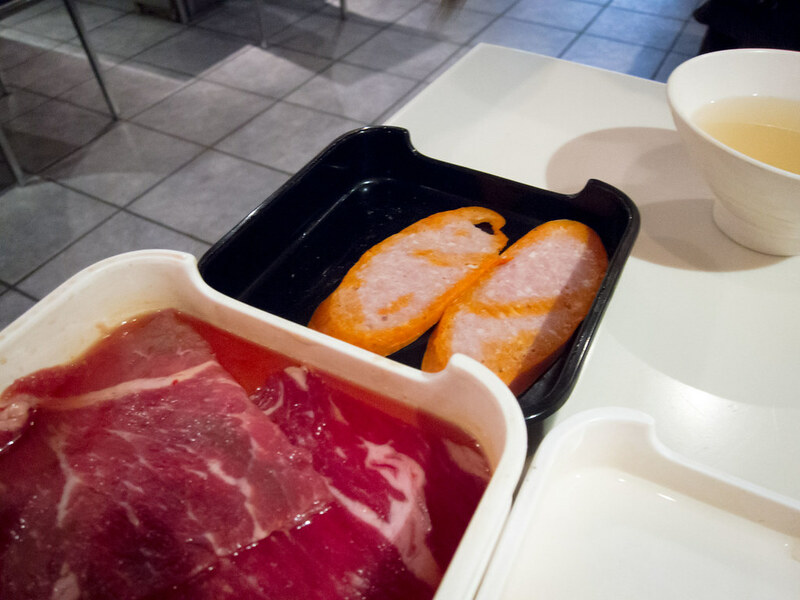 The slices of beef were thick, marbled and tender. 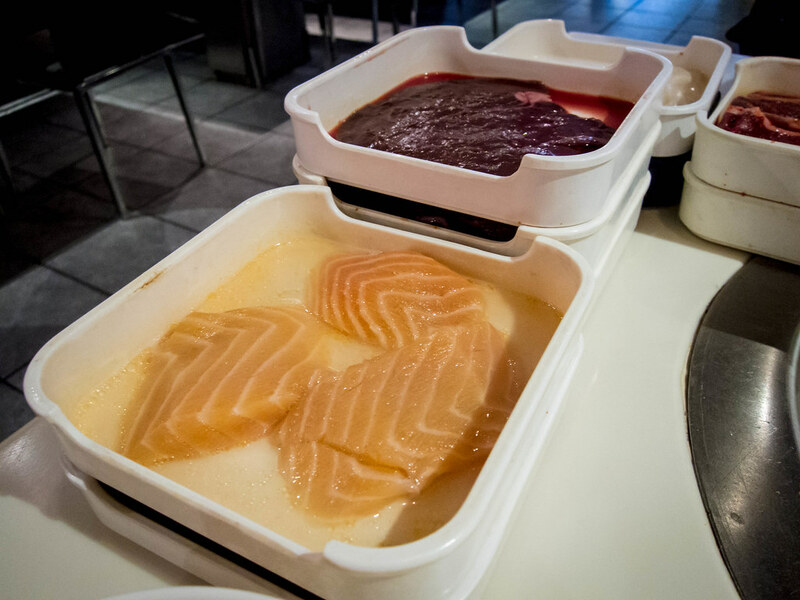 Both beef dishes were marinated ahead of time and didn’t need any dipping sauce after being cooked. 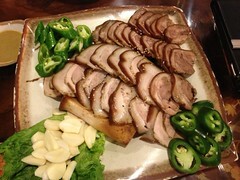 Overall, I found the quality of ingredients at Korean Grill House had improved. However, service was disappointing.